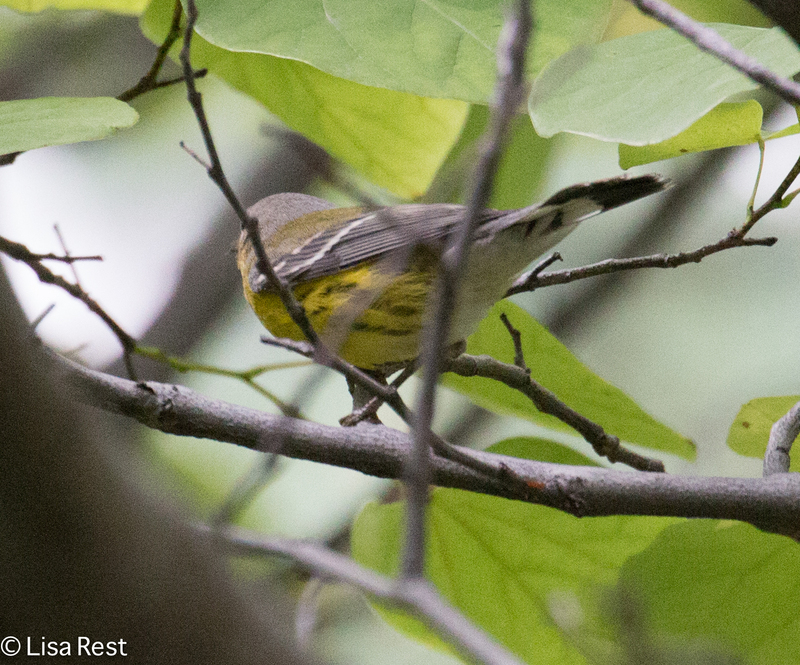 The following warblers were present at Lake Shore East Park on September 28. 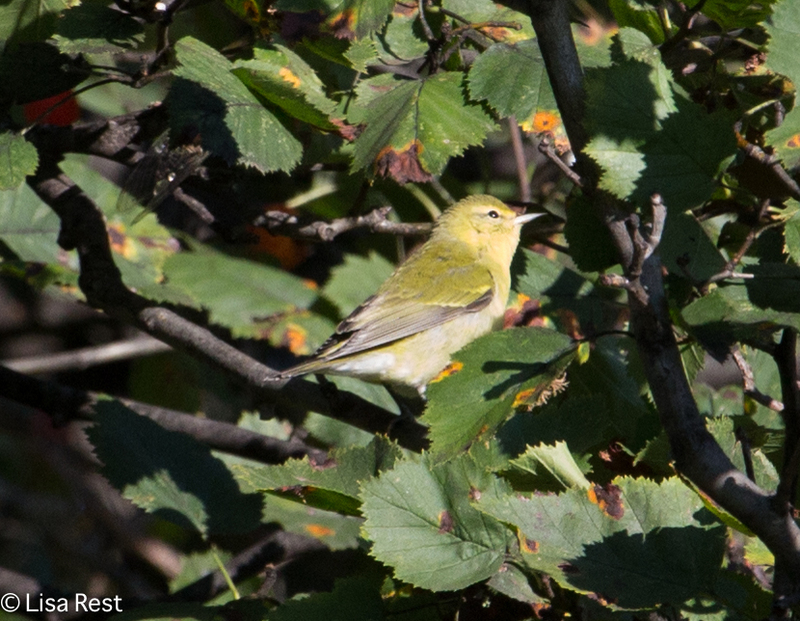 This was probably the last “peak” of warbler migration along the lakefront. 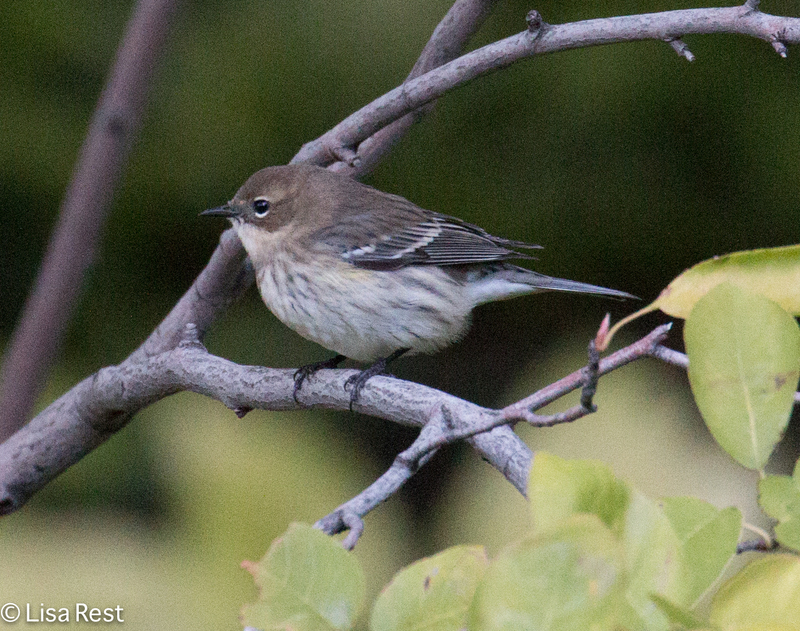 Yellow-Rumped Warblers tend to come through and hang around a bit later, so I was not surprised to see this one the following week. 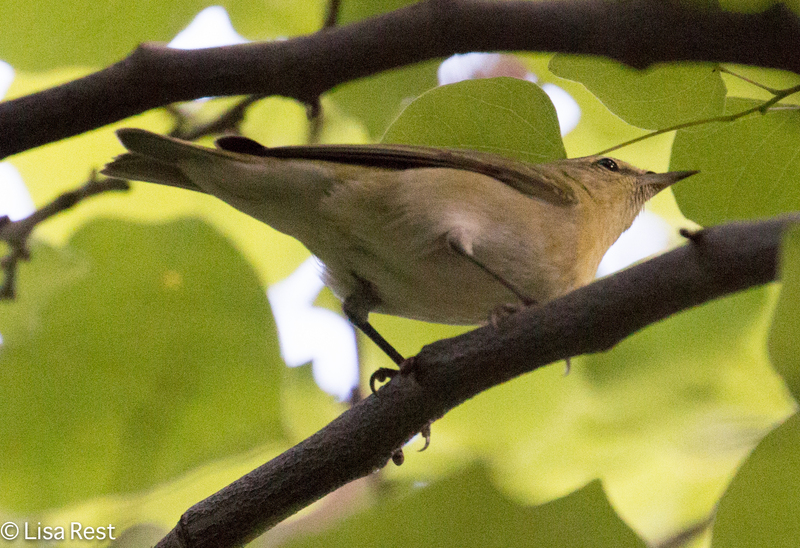 But I was surprised to find the Connecticut Warbler below poking around in the grass as I was walking through Millennium Park on my way to Lake Shore East. 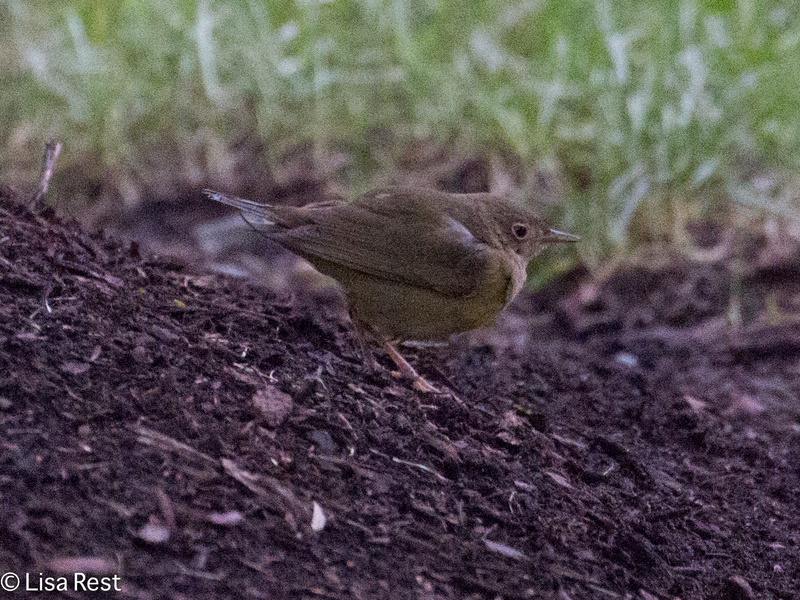 There wasn’t much light and the bird was under some trees so this was the best I could do with the photograph. 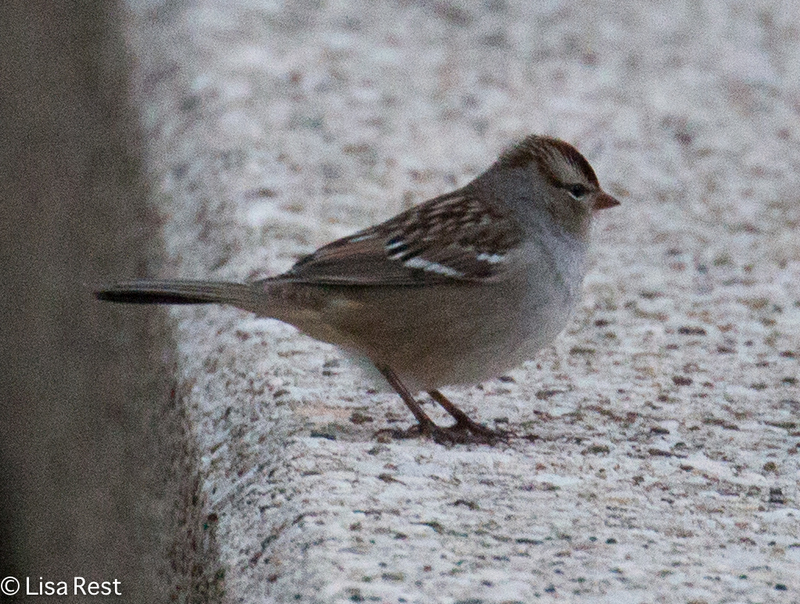 I have seen only a few White-Crowned Sparrows this fall, like the one below which popped out at 100 N. Riverside Plaza. 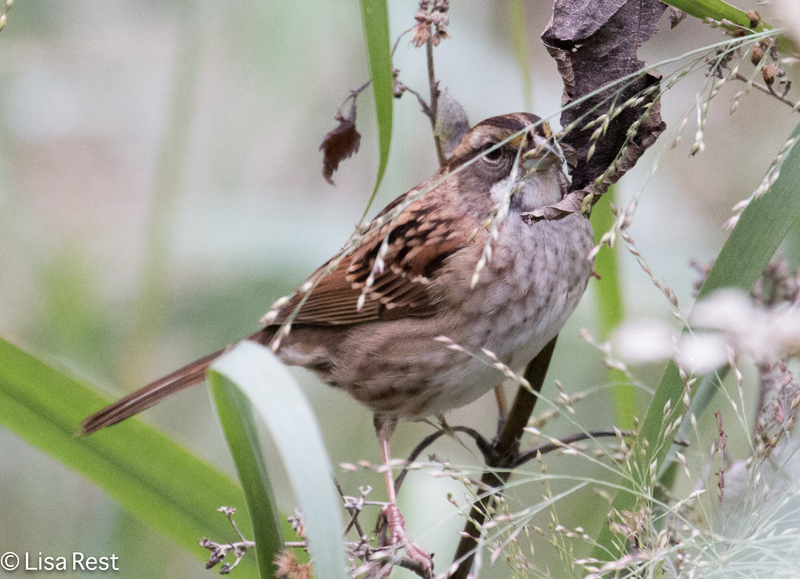 I think the White-Throated Sparrow below was also from this new location. I will have more pictures and more to say about this newly discovered green space area along the Chicago River in a future post. 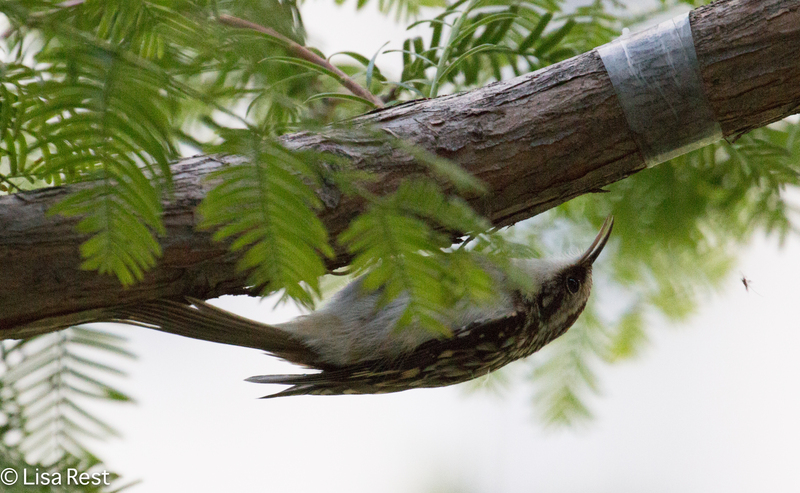 There have been a lot of Brown Creepers this fall migration. 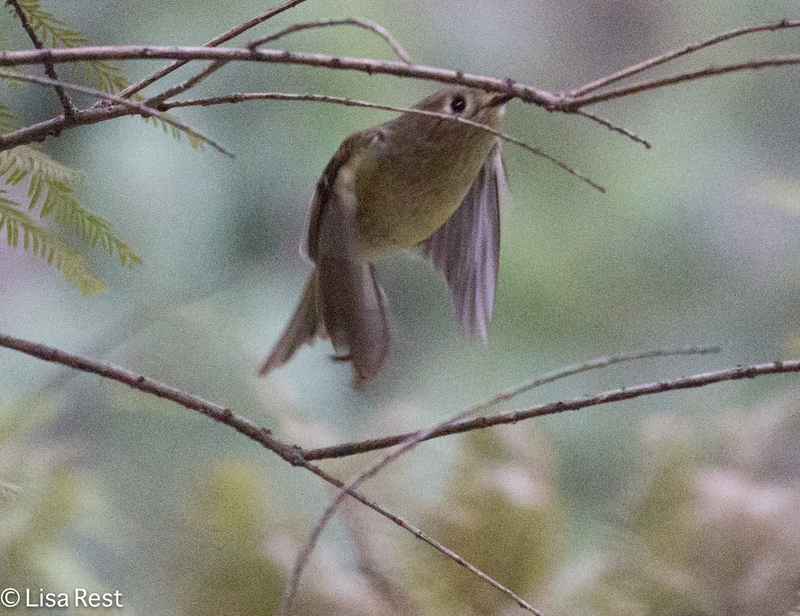 For a couple weeks, almost, the most ubiquitous bird seemed to be Hermit Thrushes. I am still seeing an individual here and there. 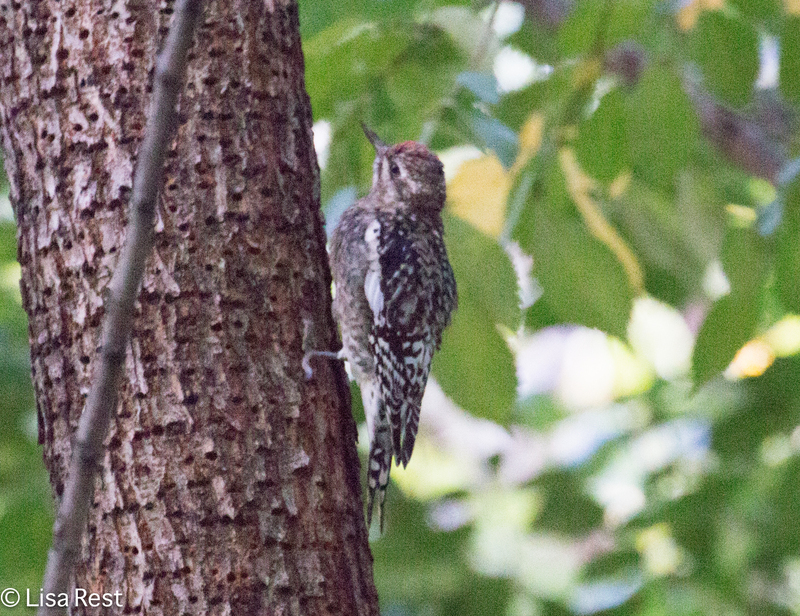 The Yellow-Bellied Sapsuckers are now all gone. 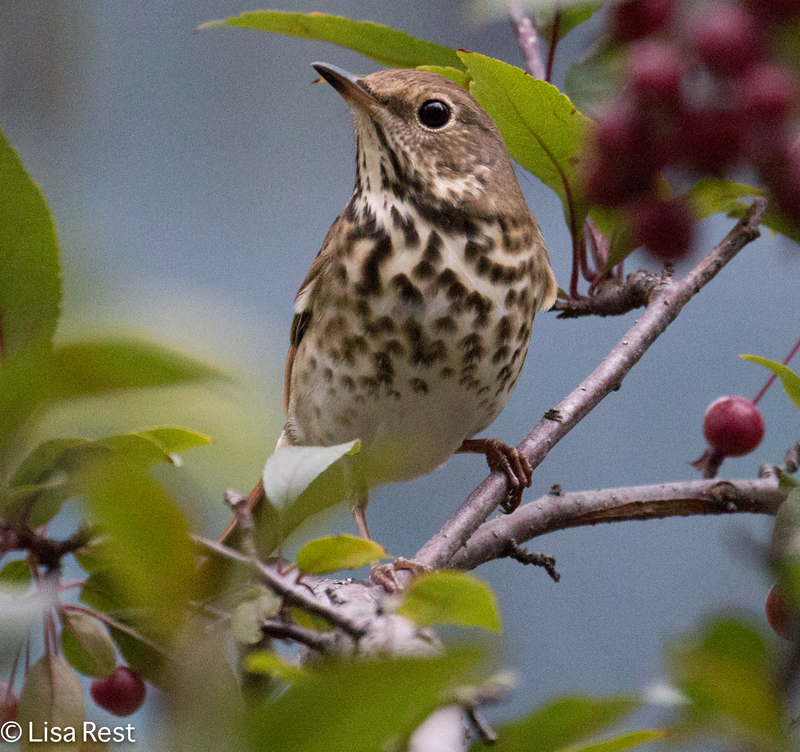 At first I thought the bird below was yet another Hermit Thrush but on closer inspection I have decided it’s probably a Gray-Cheeked Thrush. 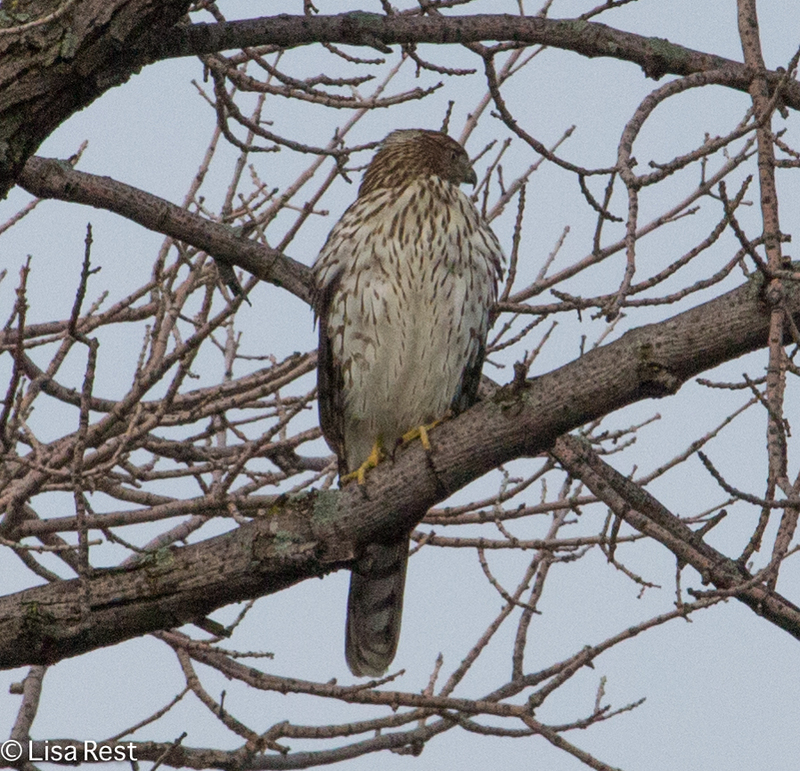 Light can be tricky, but the heavy spotting on the breast and the darker flanks give him away almost more than his facial pattern. 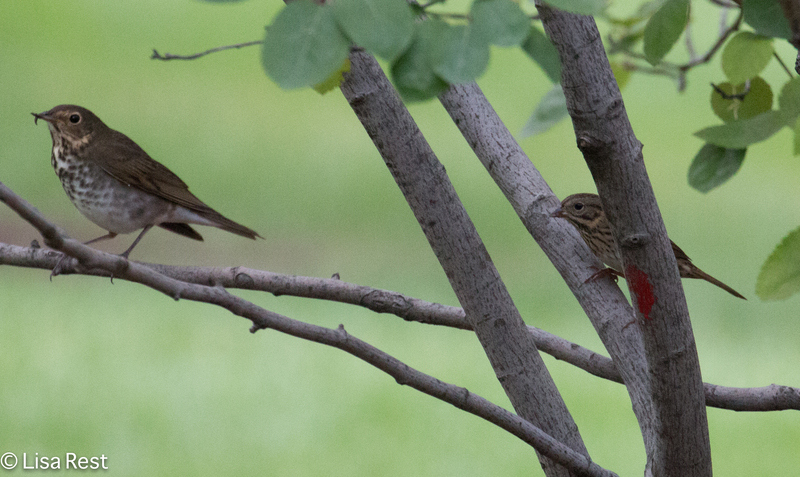 And for the longer view, here he is again sharing tree space with a shy Lincoln’s Sparrow. 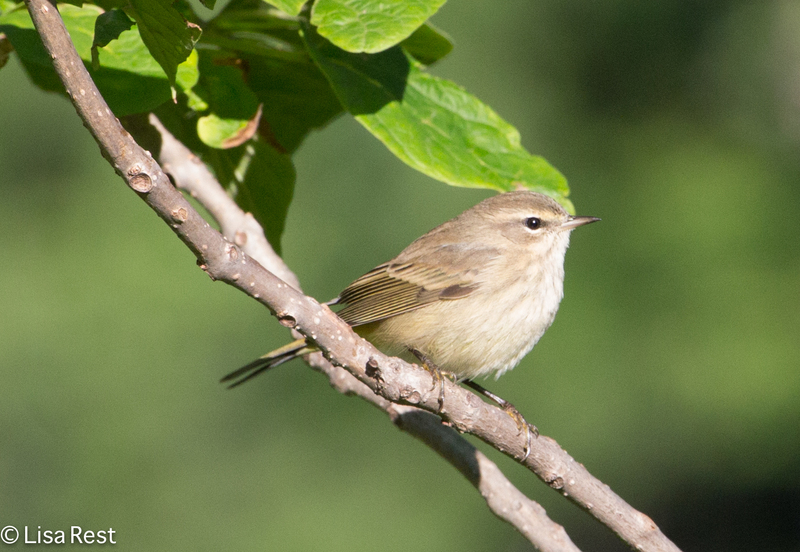 So the warblers are all gone until spring. 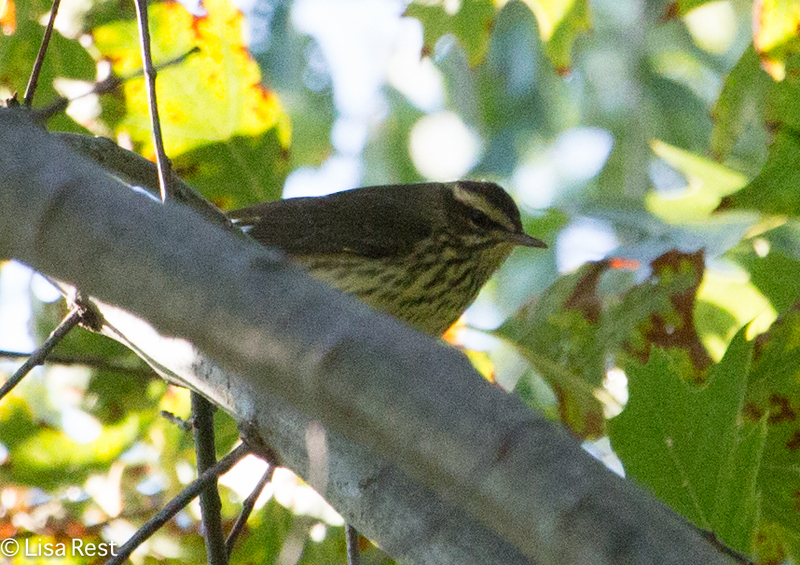 I did have a late Black-Throated Green Warbler on October 22nd which I posted on my flickr page before I realized I could now just upload it directly into ebird. 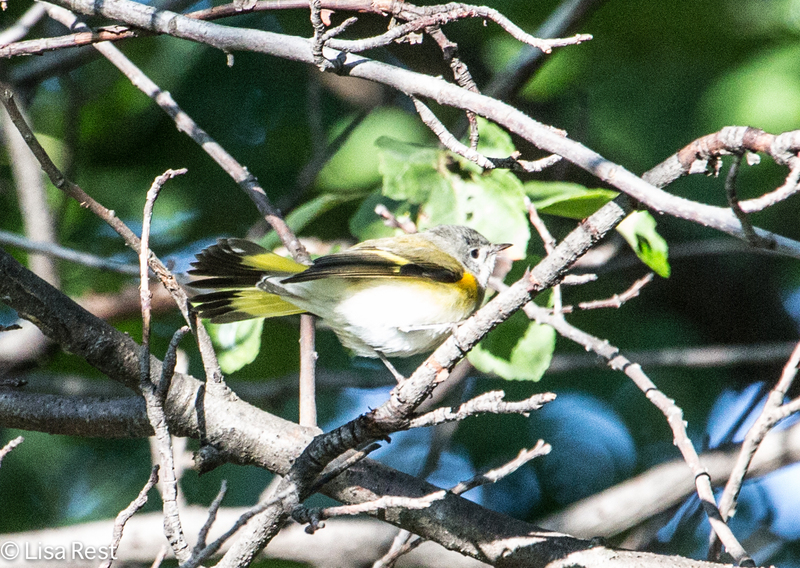 It was my last “rare bird” sighting. 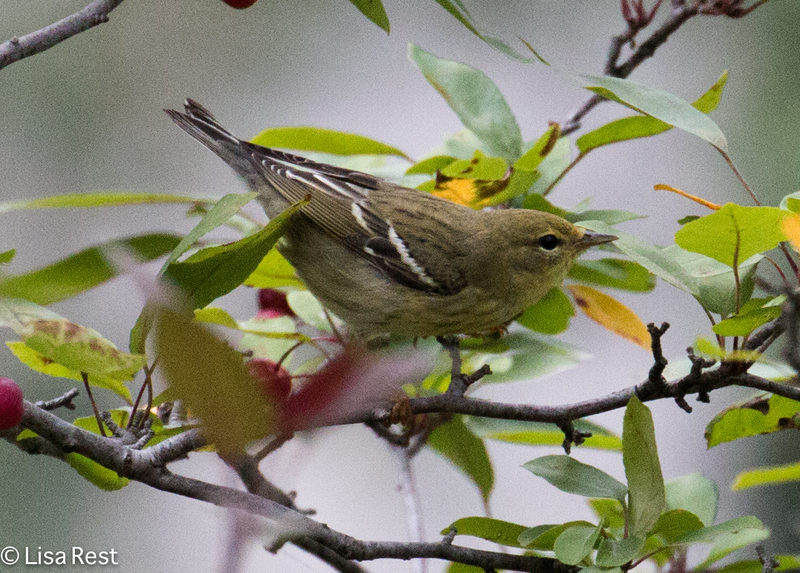 Below is another picture of the beautiful Blackpoll Warbler from September 28. I have more posts in mind and am just working on finding the time and mind space! Thanks for your patience and indulgence! 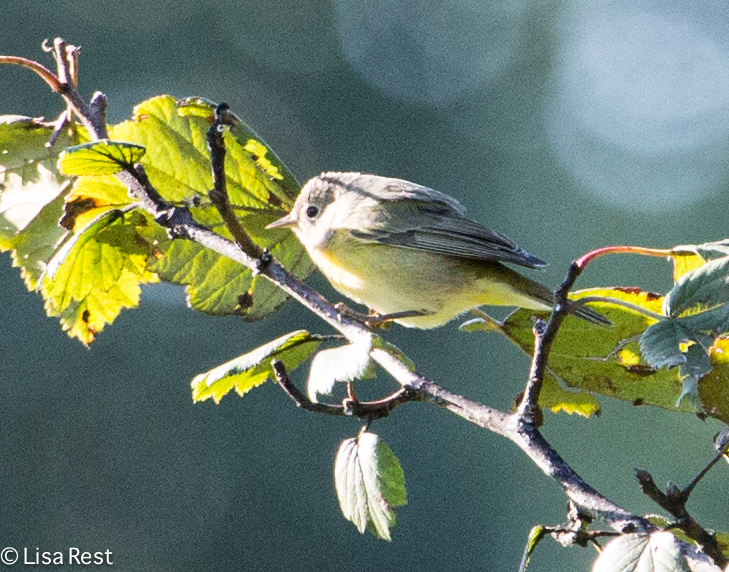 I never manage to see enough of any one species to tire of them. 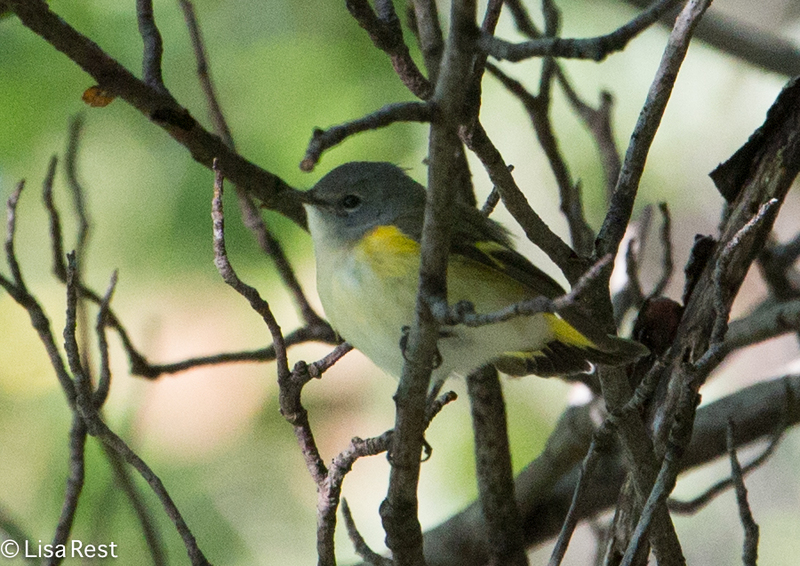 Although Tennessee Warblers often appear abundant, they are not always easy to capture. 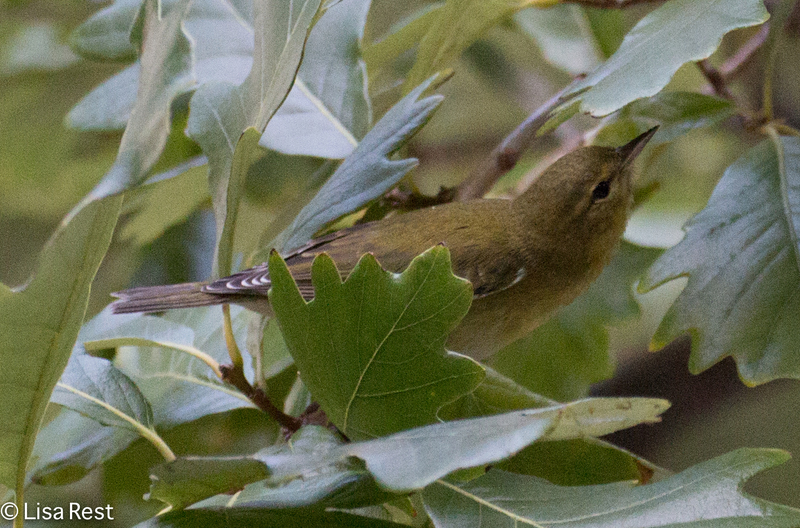 For comparison with a species they resemble, I have an Orange-Crowned Warbler below. 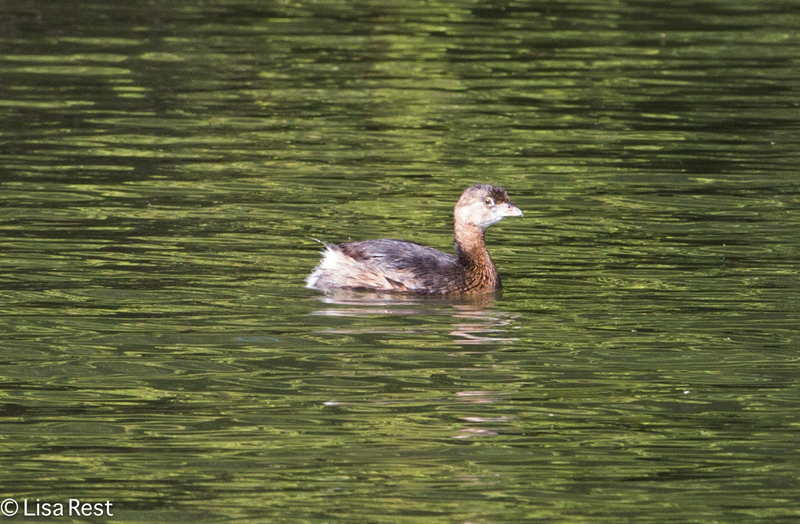 There seemed to be fewer birds altogether this year, but I don’t know if it is due to loss of habitat, weather patterns, being in the wrong place at the wrong time or a combination of all three. 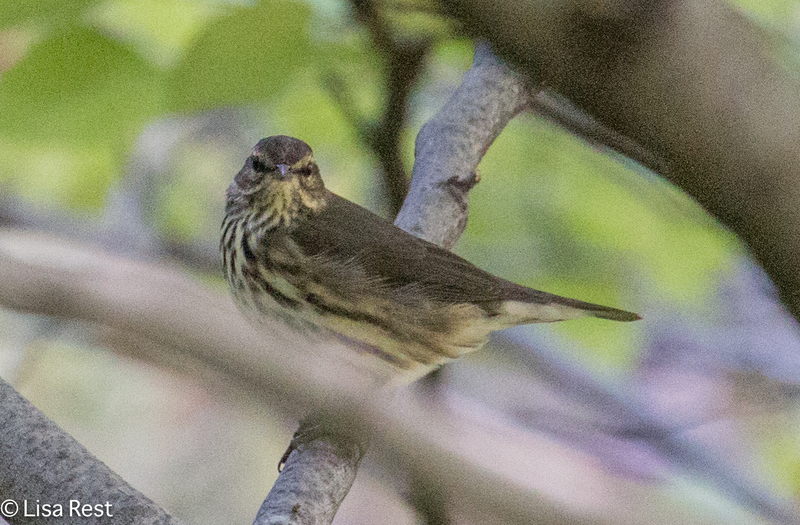 I frequently see Northern Waterthrushes on the ground, but less often perched in trees. 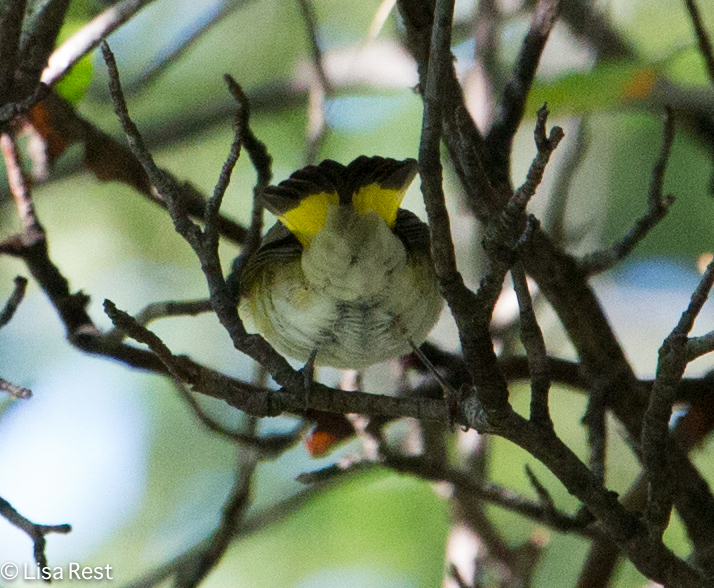 The day I saw the Kentucky Warbler, there were so few birds altogether at Lake Shore East Park I wasn’t even aware I had seen this rarity until I checked my photographs later. The bird kept ducking in and out of hydrangeas planted near the east end of the park and I was consumed with trying to stop it long enough for a picture. 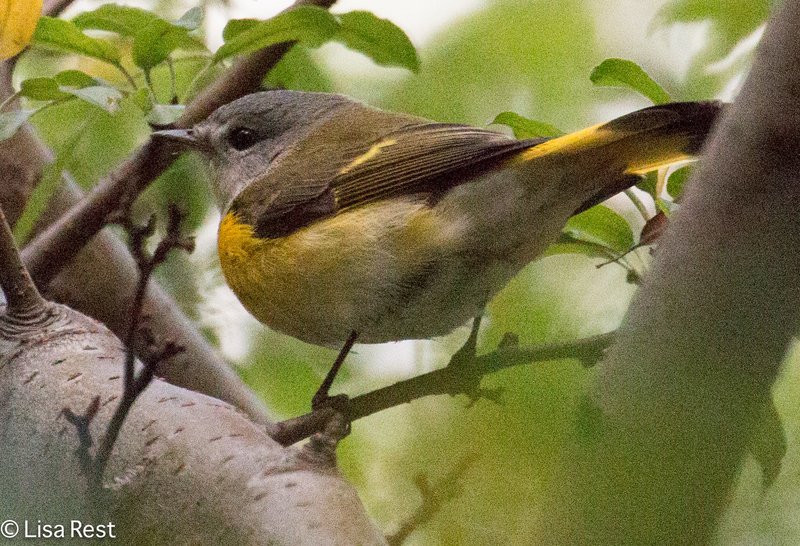 First-year male American Redstarts seem to be born exhibitionists, on the other hand. 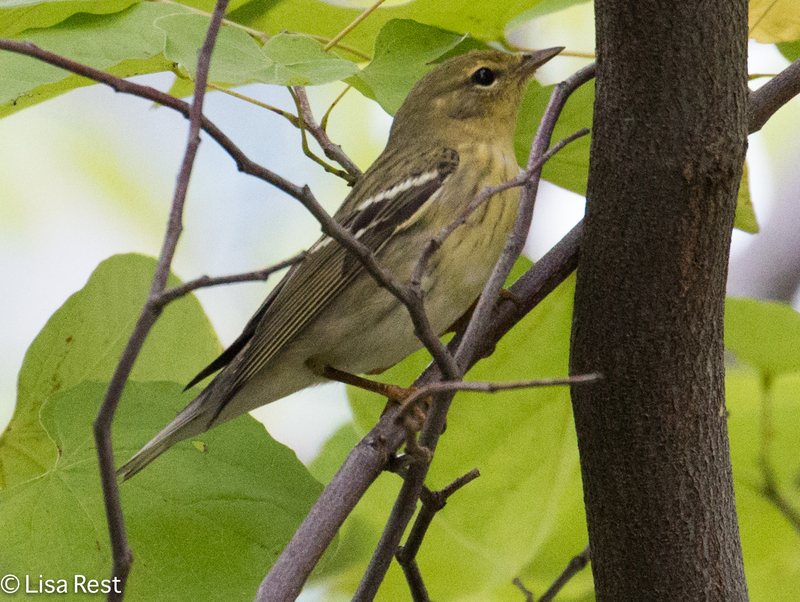 This Blackpoll was pretty cooperative too on the day I saw it. 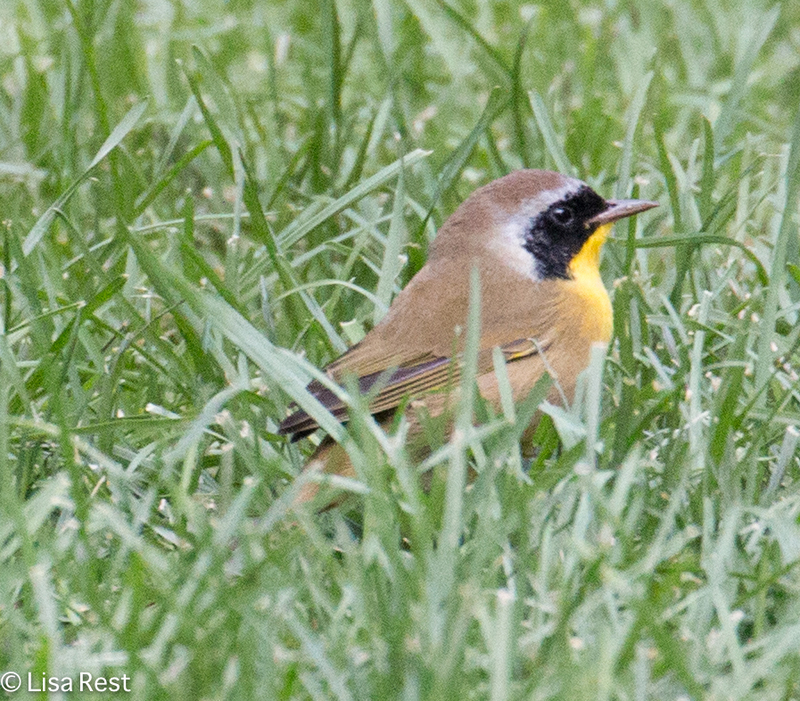 And Common Yellowthroats, as difficult as they are to see on their breeding grounds…are frequent park visitors. 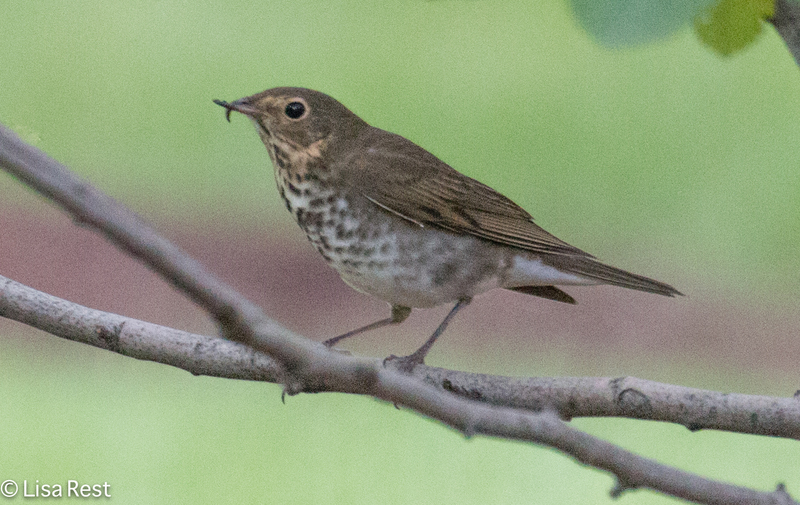 A Hermit Thrush reminding me It’s The Food, Stupid. 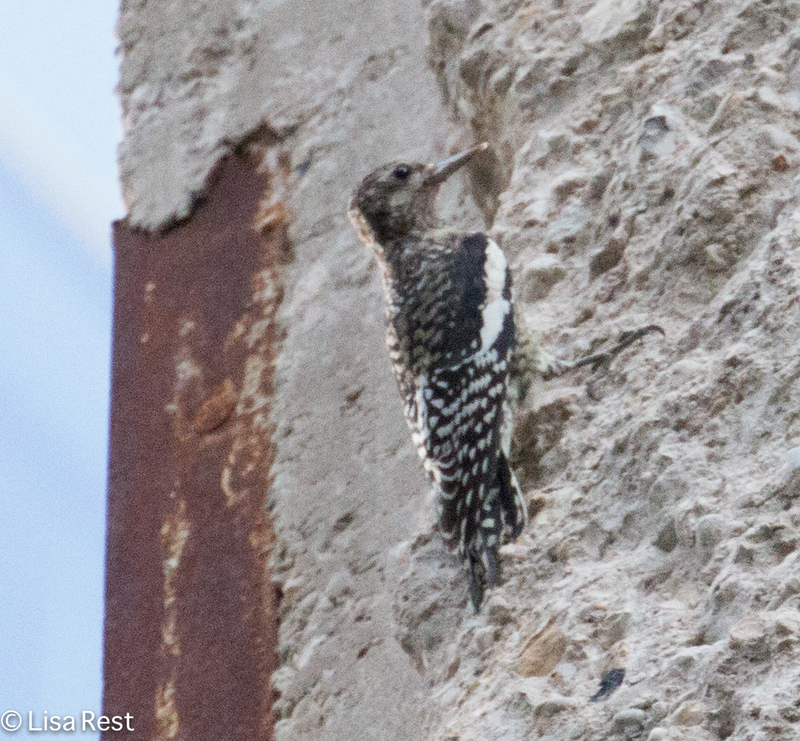 At 155 N. Wacker there haven’t been very many birds, but last week there was this sapsucker scaling a wall. 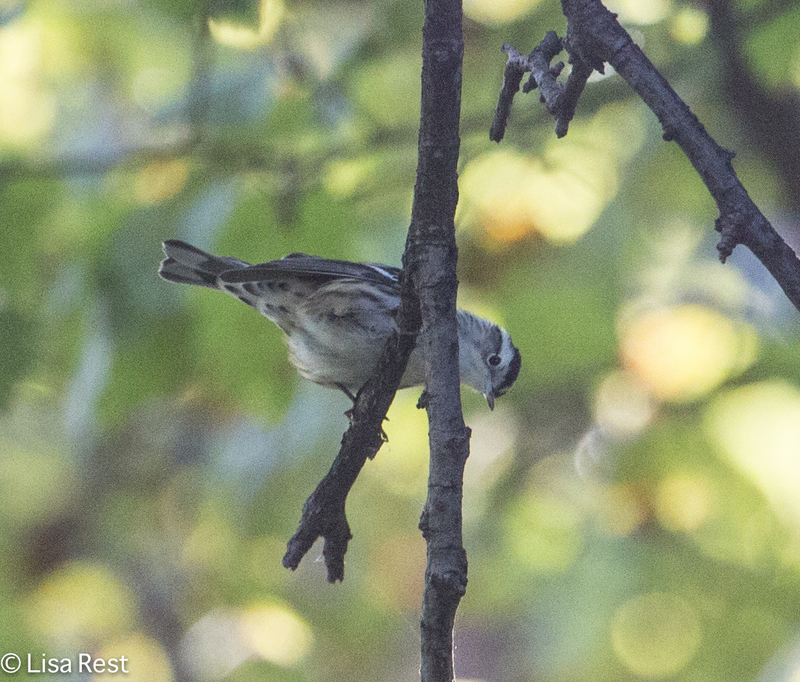 And a White-Crowned Sparrow popped out last week at a new spot on the river that looks promising for future visits. 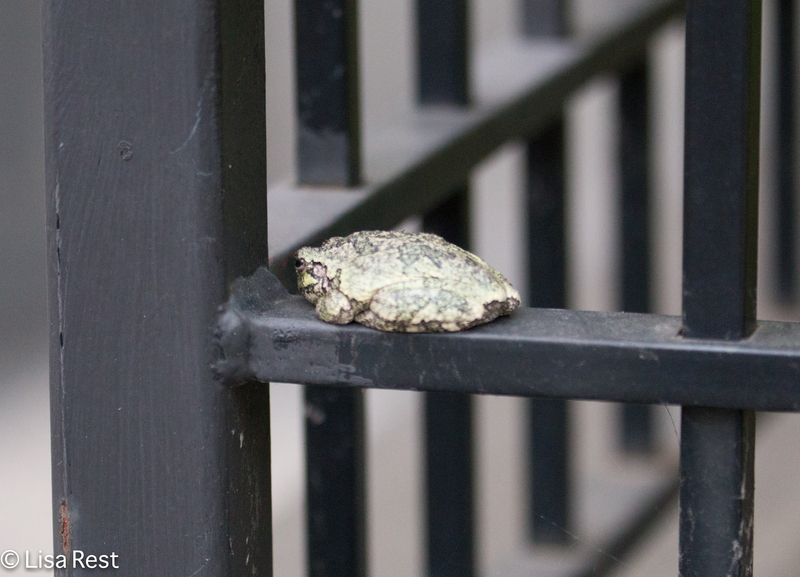 Perhaps the strangest thing I saw this fall was a frog in the corner of one of these wrought-iron-encased planters on Randolph near Wacker. How it got there boggles the mind. 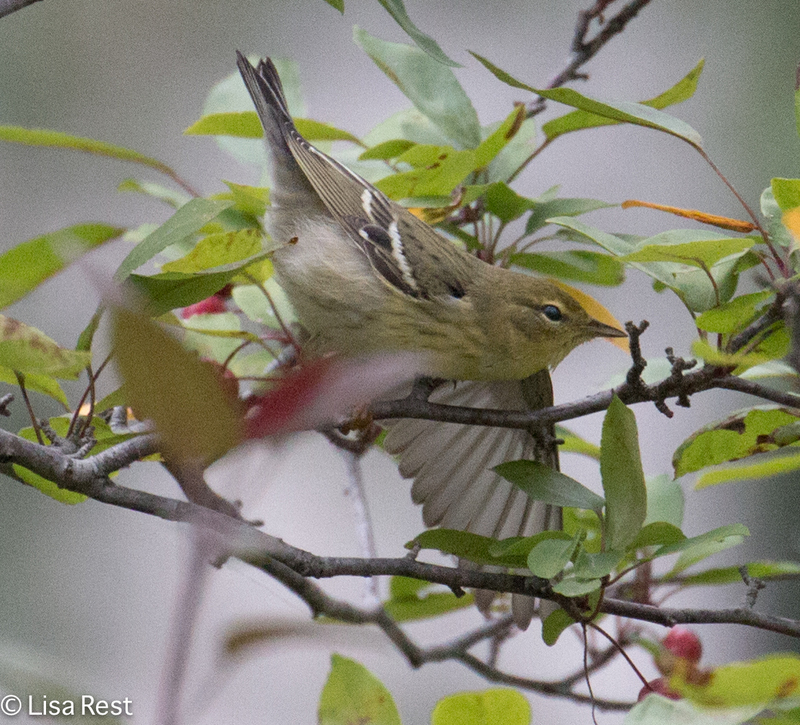 It’s time to say goodbye to the warblers until spring. 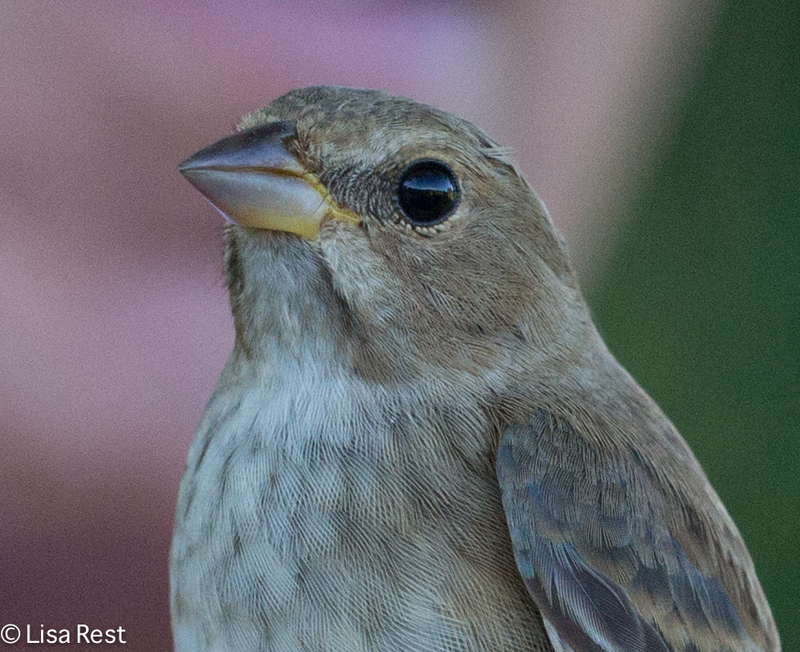 But many more sparrows are likely to be showing up. I’m thankful for that because they tend to be easier to see! 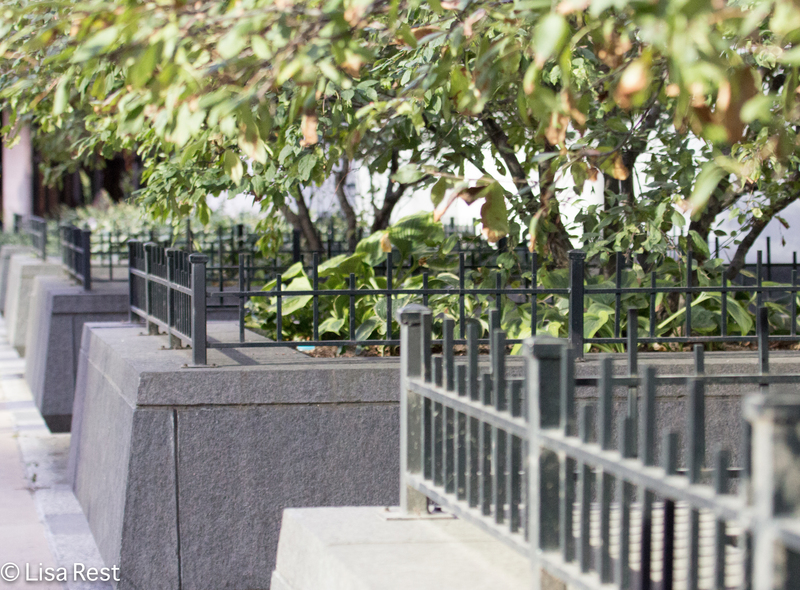 And at least I can always carry on a conversation with White-Throated Sparrows. 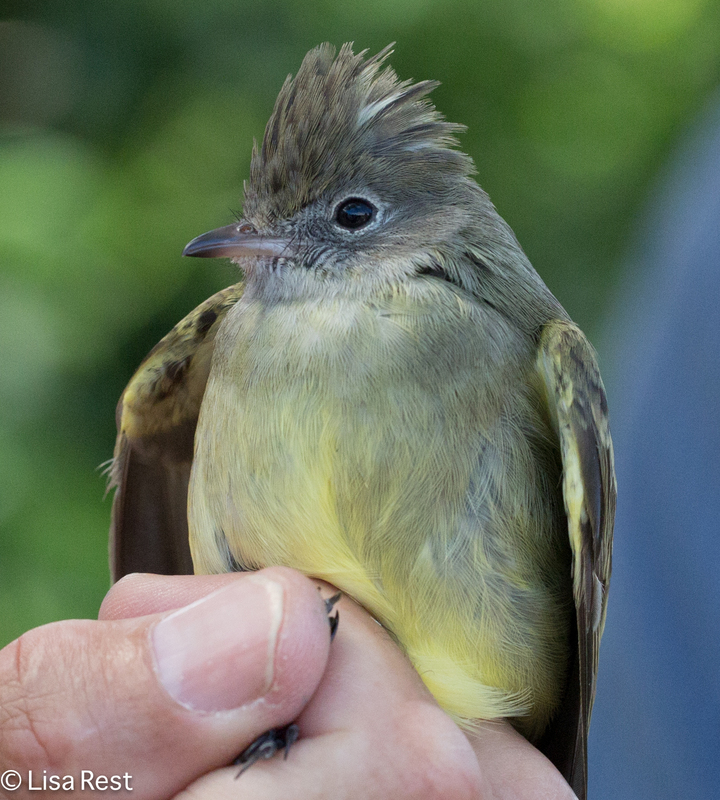 As I start to go through the pictures from Costa Rica, some of the best bird images are invariably closeups of birds shown to us by Dr. Bill Hilton Jr. 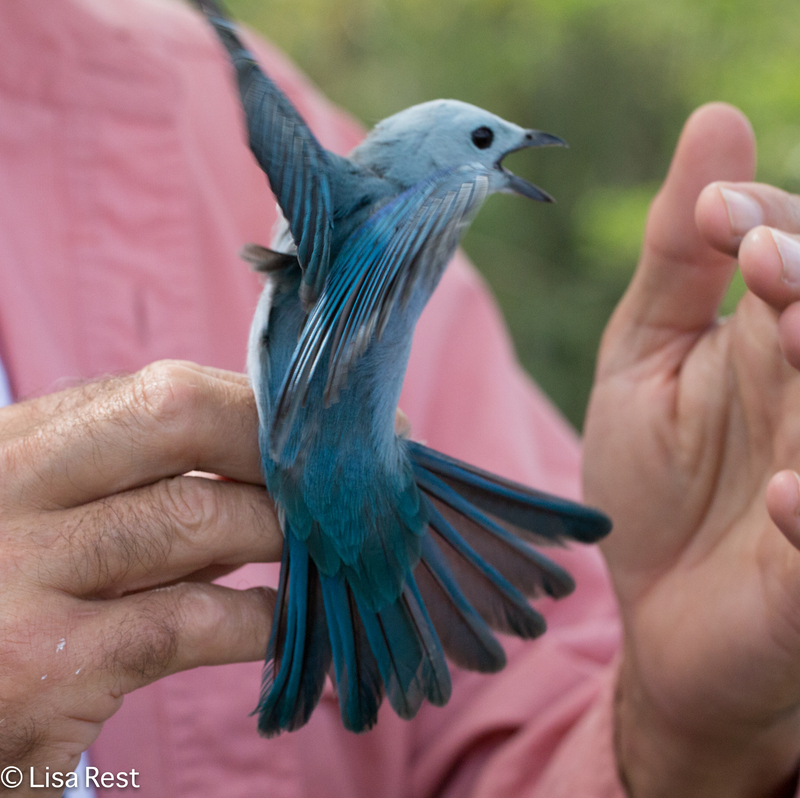 These were invaluable teaching moments on the part of Bill and the birds themselves. 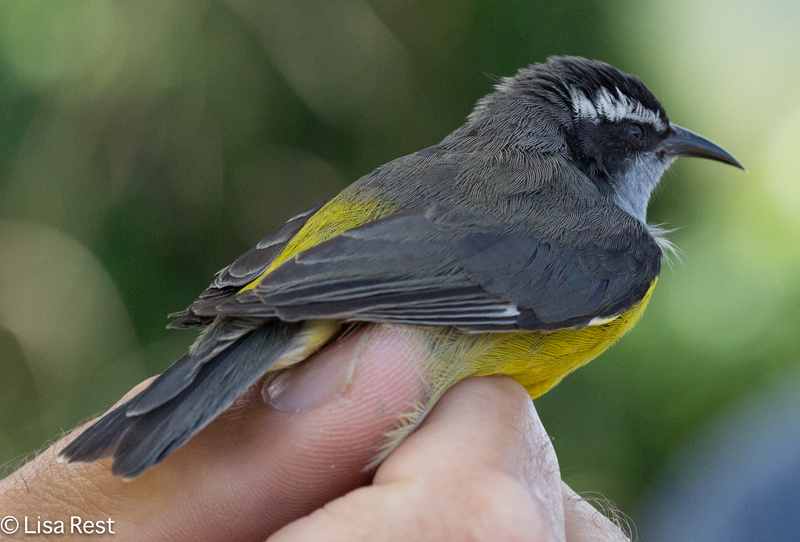 Although the focus of the Operation Rubythroat trip to chayote fields in Ujarras Valley, Costa Rica, was ultimately to trap, band and release as many Ruby-Throated Hummingbirds as possible over six days in the field (more about all this in a future post), invariably, other birds sometimes got trapped in the nets. 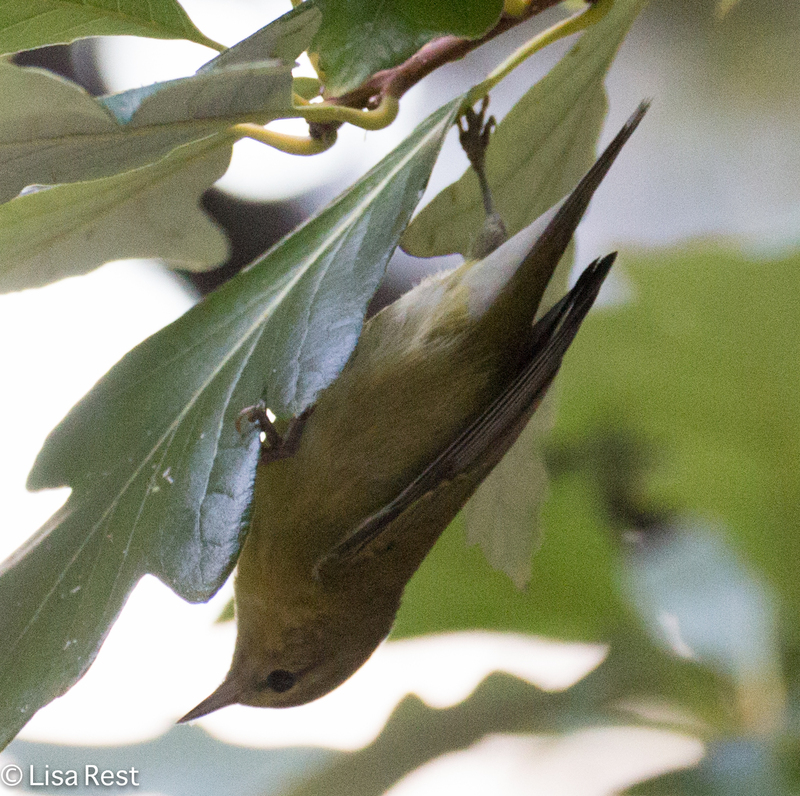 Any bird trapped was a potential teaching opportunity. 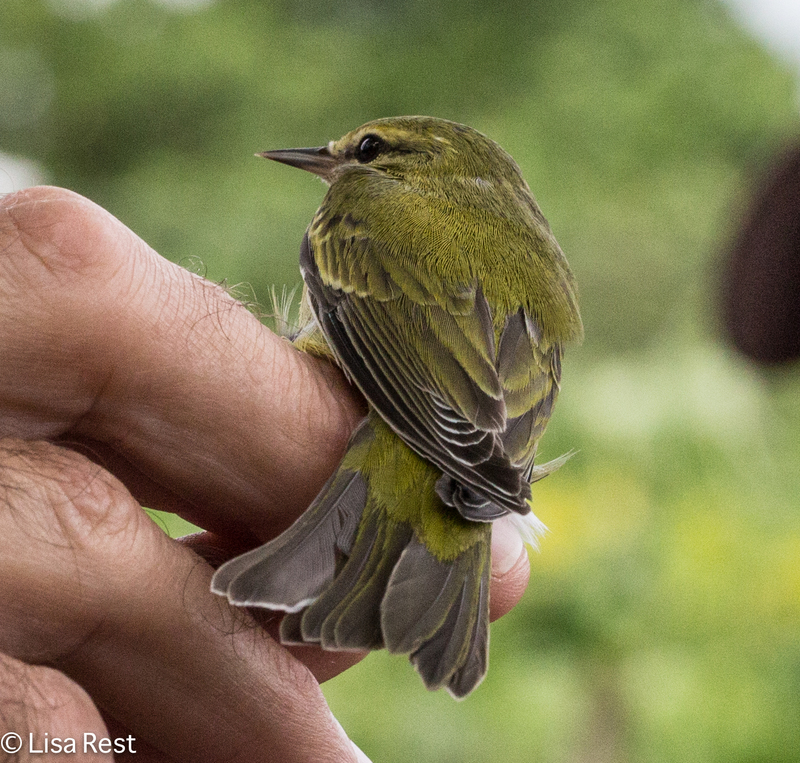 Neotropical migrants were retained for banding. 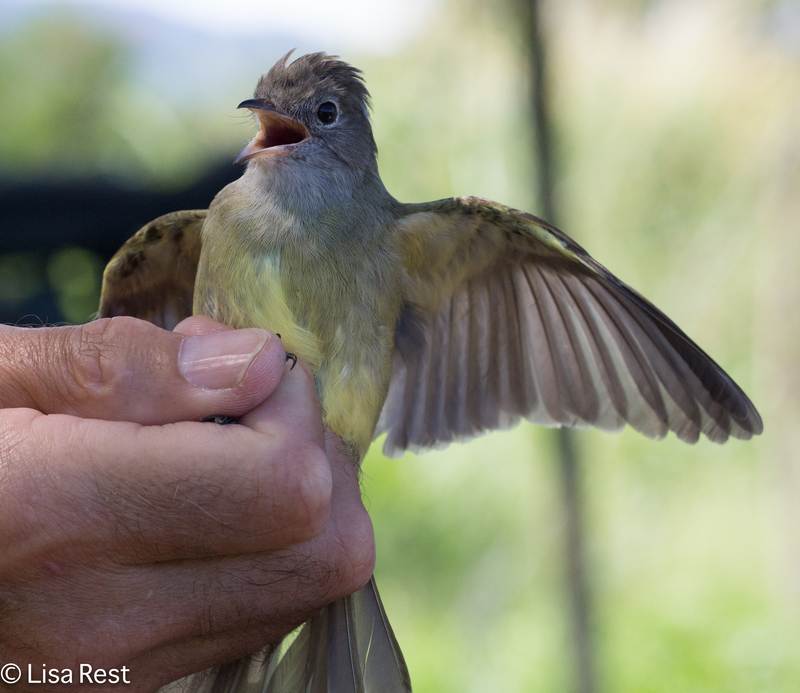 But after we had seen a species native to Costa Rica once at the banding table, which is where we gathered for these demonstrations, all future caught birds of that species were immediately released. 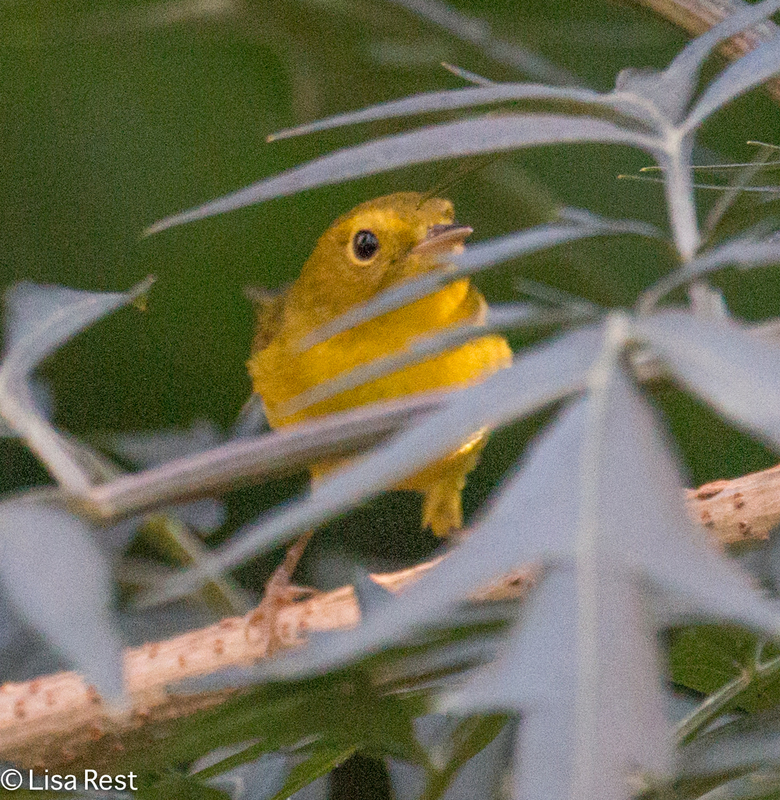 With field guides in hand, we studied the birds until we were able to identify the species. 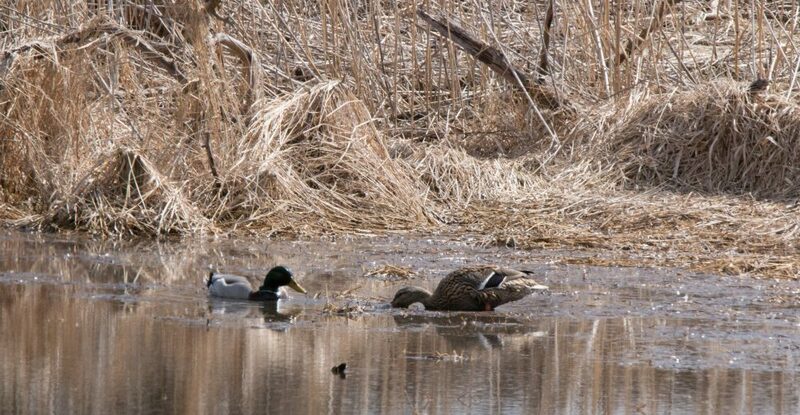 Bill would only help by pointing out various field marks, but he also elaborated on other features you might never see unless you had the bird in your hand. 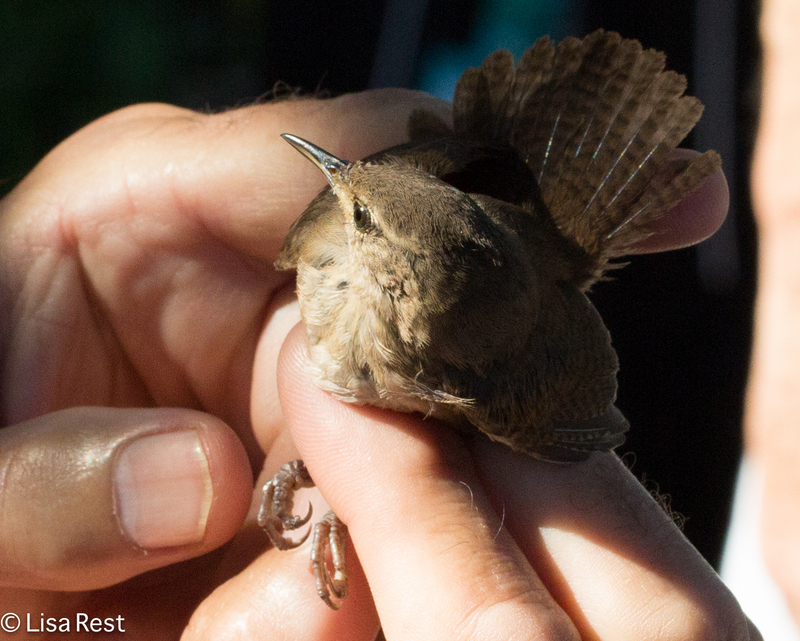 Some species were familiar, but the opportunity to study them so closely was absolutely phenomenal. For those who are squeamish about the trapping and handling, I admit I once was too, but Bill treats the birds with the utmost respect and care. 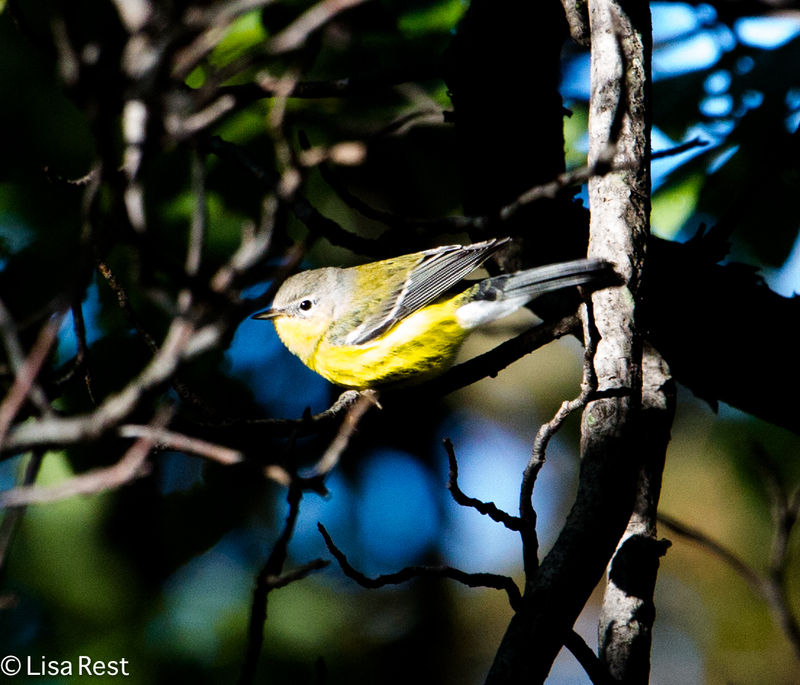 You can go to a museum and study skins, but for color and presence there is nothing like a live bird. 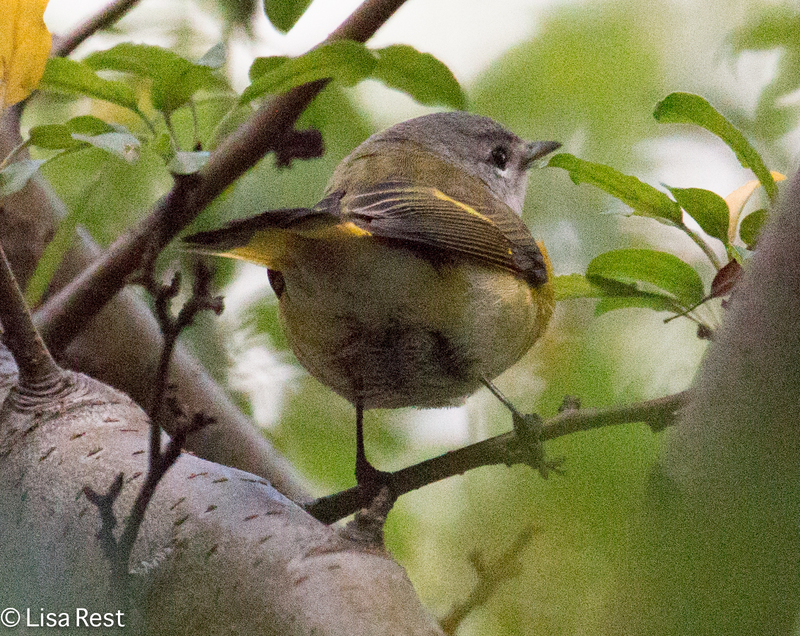 I have seen Blue-Grey Tanagers virtually every time I have visited the American tropics. 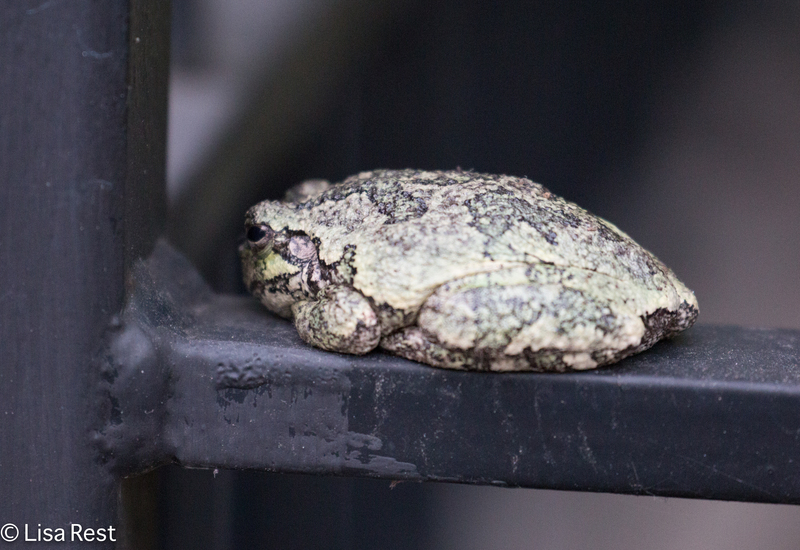 They are ubiquitous and easy to identify. 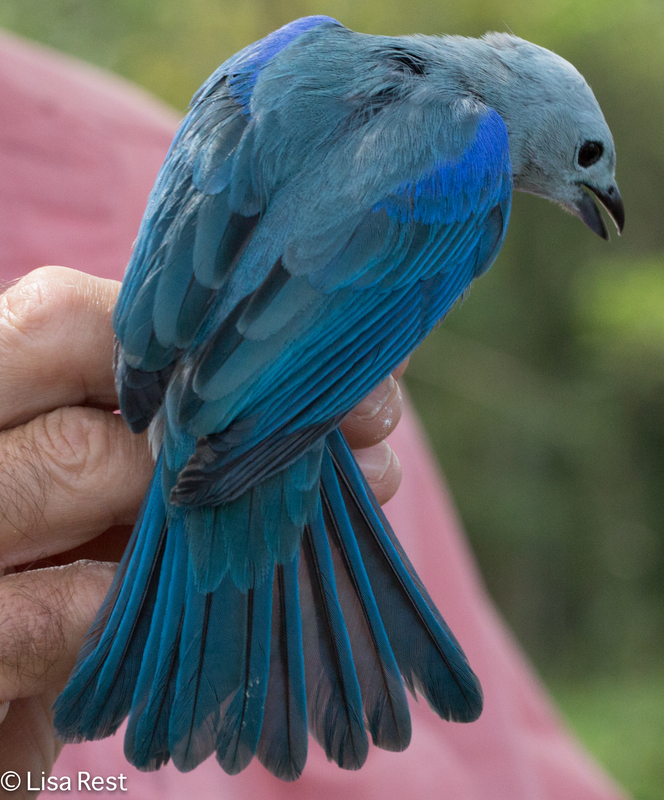 But I have never seen a Blue-Grey Tanager like this before. 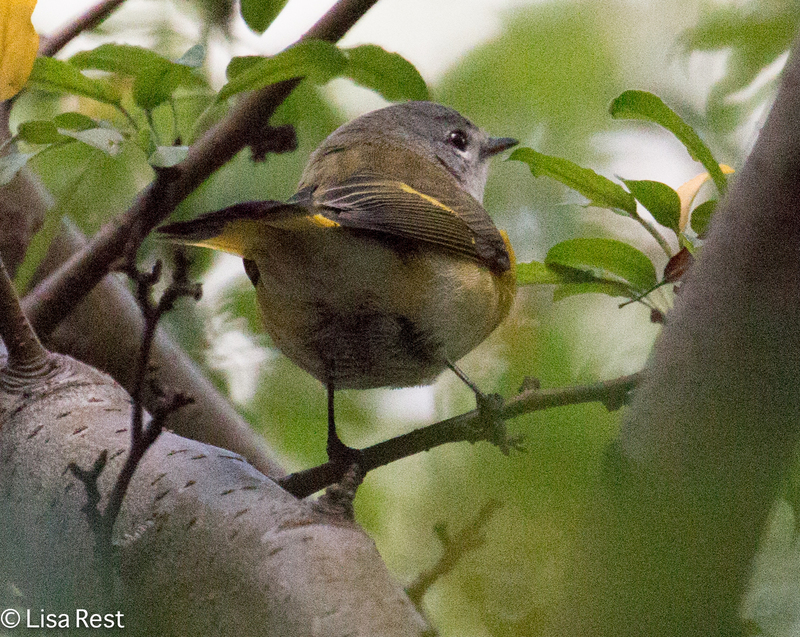 The afternoons invariably turned cloudy and sometimes rainy, which made taking pictures of other birds anything from challenging to impossible. Nevertheless I managed to get some good photographs, and I will be back with many more. 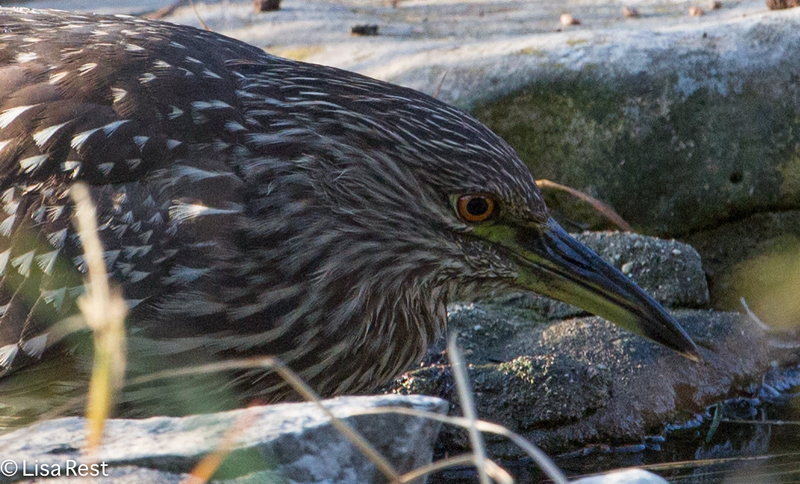 These are just a sampling of some of the earliest birds we saw in the hand, and I will be back with others, as well as eventually adding pictures to my flickr page. As for the timing of this post, I woke up in the middle of the night thinking about the past week. Sleep has been erratic at best, and I’ve been emotionally exhausted. I went to bed early last night, so I guess it’s not altogether strange that I am awake at 3:00 a.m. Trying to go back to sleep I started reviewing the past week, and that wasn’t all good, so I shifted my thoughts to things I want to accomplish, which woke me up even more. 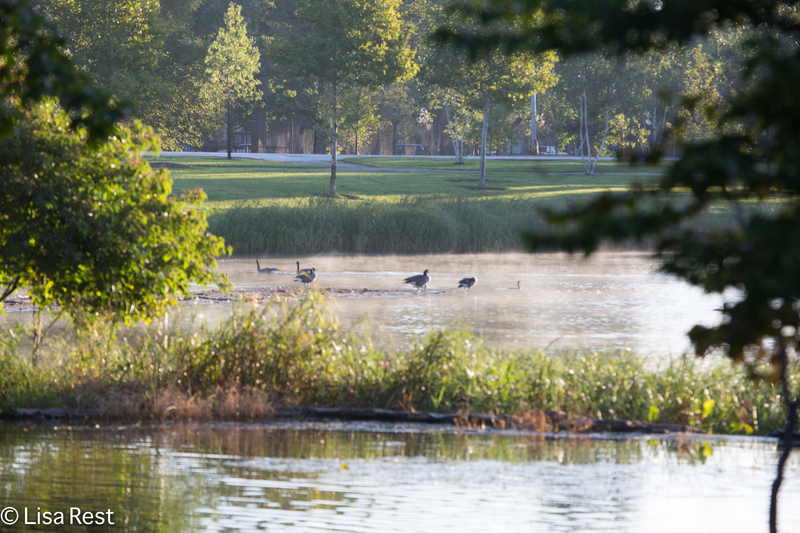 When I started thinking about this post which I started to work on last night before I conked out on the futon, it seemed prudent to just wake up and finish the post. I apologize for any detectible grogginess. I think I’ll grab a drink of water and go back to sleep for a couple hours. 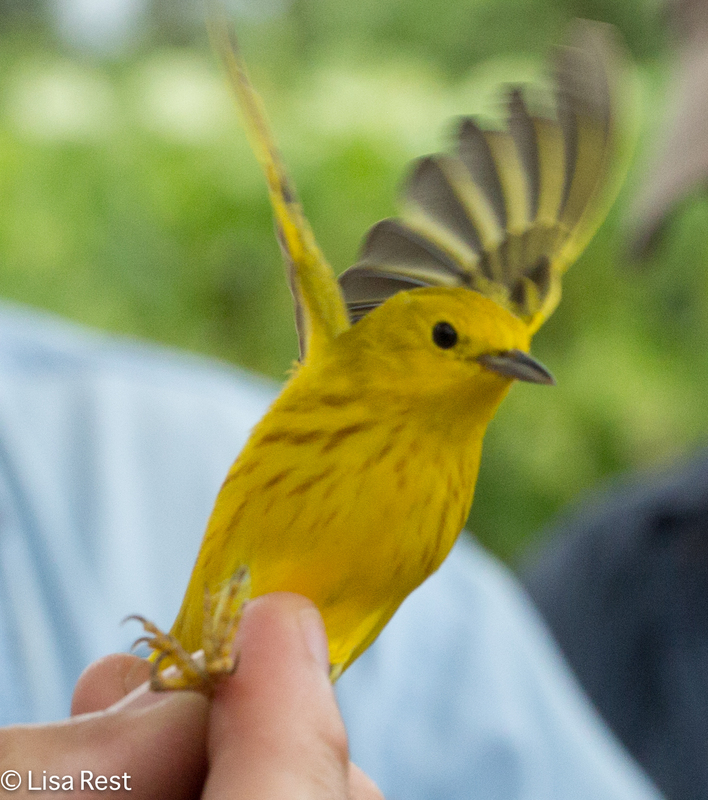 Yellow Warblers and Tennessee Warblers were the most-frequently-caught neotropical migrants. 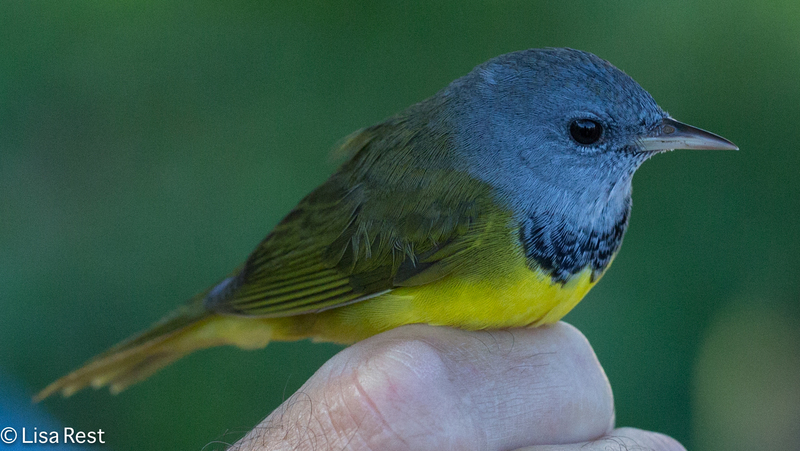 At some point, we had caught so many Tennessee Warblers, we released them from the nets without banding them. 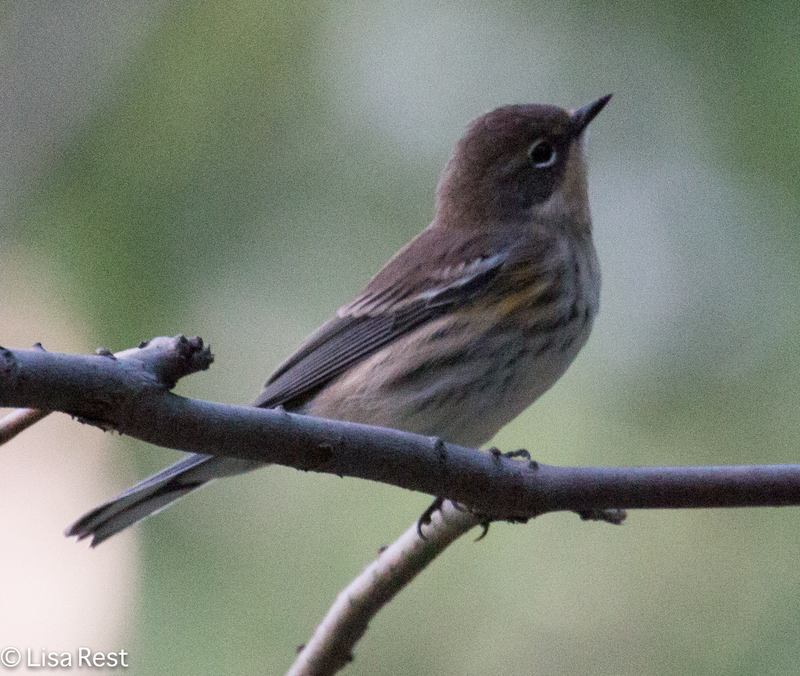 Tyrant Flycatchers can be confusing. 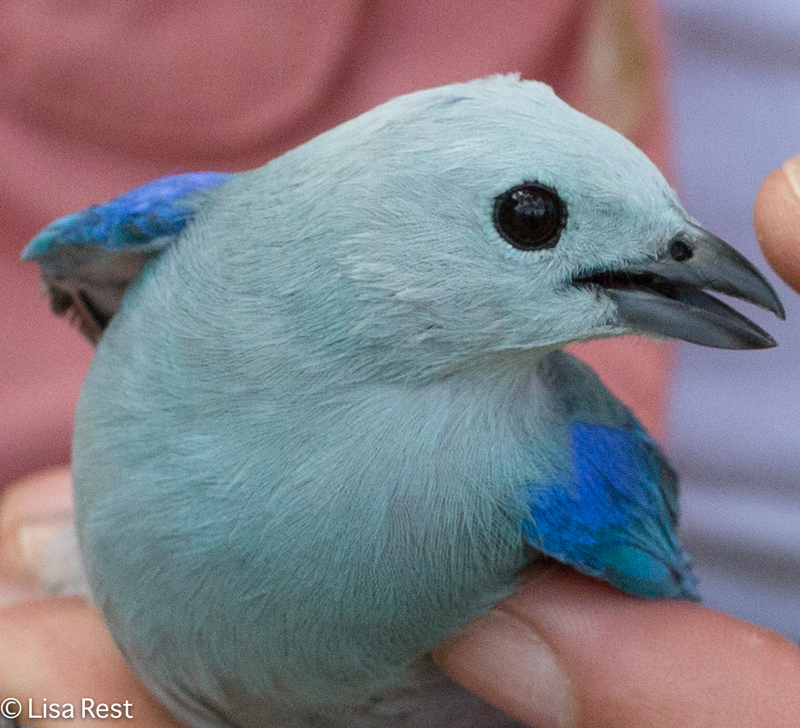 One more of the Blue-Grey Tanager, up close and personal. Truth be told I did not stay in last Sunday because the rain was threatening but not really materializing, so I managed to visit the Portage and almost envisioned doing a post about what surprises were there, but I keep succumbing to that temptation (“What’s your favorite photograph?” “The one I just took”) and then I never get back to documenting previous outings. So while I have been recalcitrant catching up with other bloggers I am going to try at least to catch up a bit with myself. Whatever my obsession to try to hold on to the last experience, these pictures are more from the 13th trip to Columbus Park, which is a park on the west side of Chicago, making it barely a stone’s throw away. 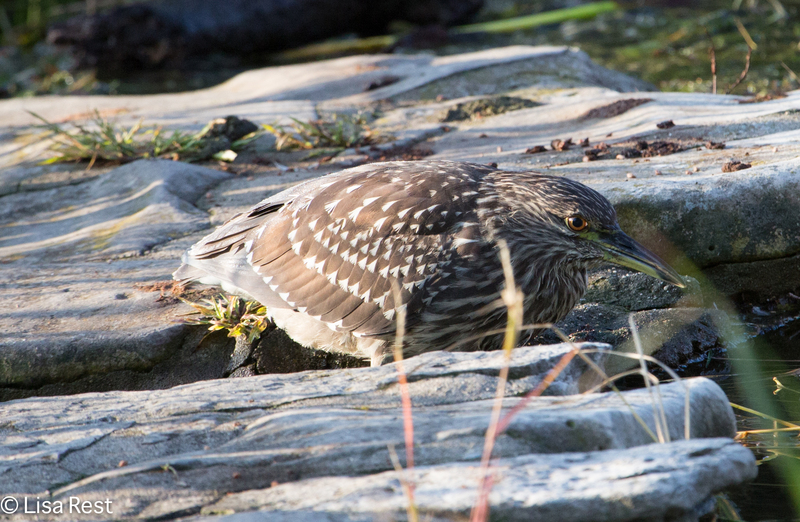 There’s a nice water feature going on at the park, and perhaps the star was a juvenile Black Crowned Night Heron contemplating how to make a living. 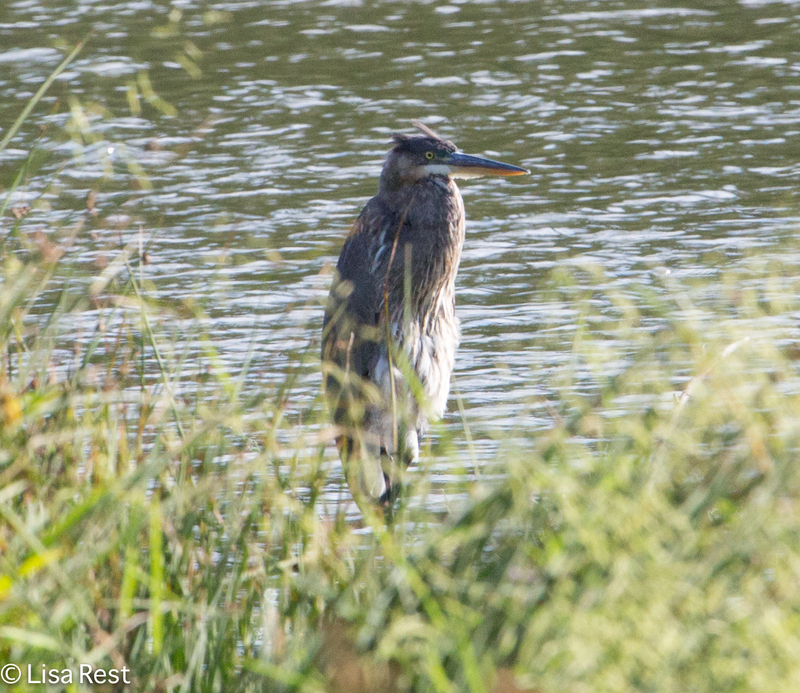 Also present, a Pied-Billed Grebe and a Great Blue Heron. 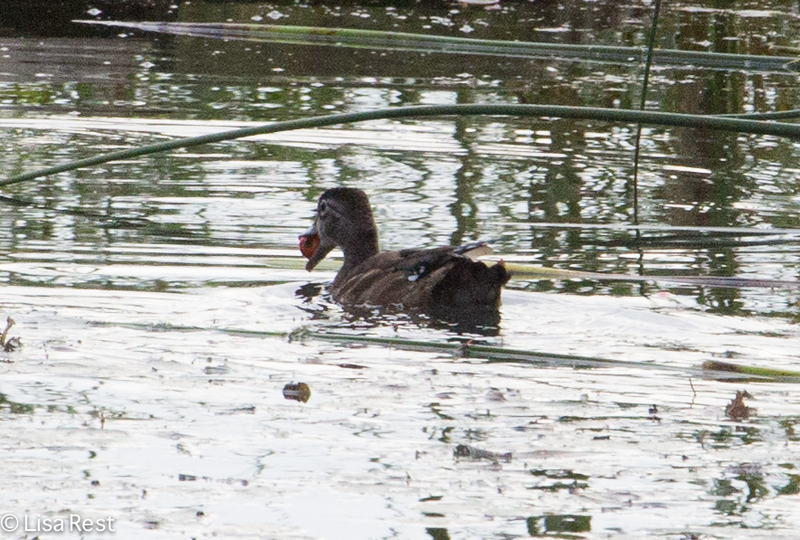 I don’t recall if I realized the Blue-Winged Teal was eating a crabapple when I took the picture but it seems a little odd. 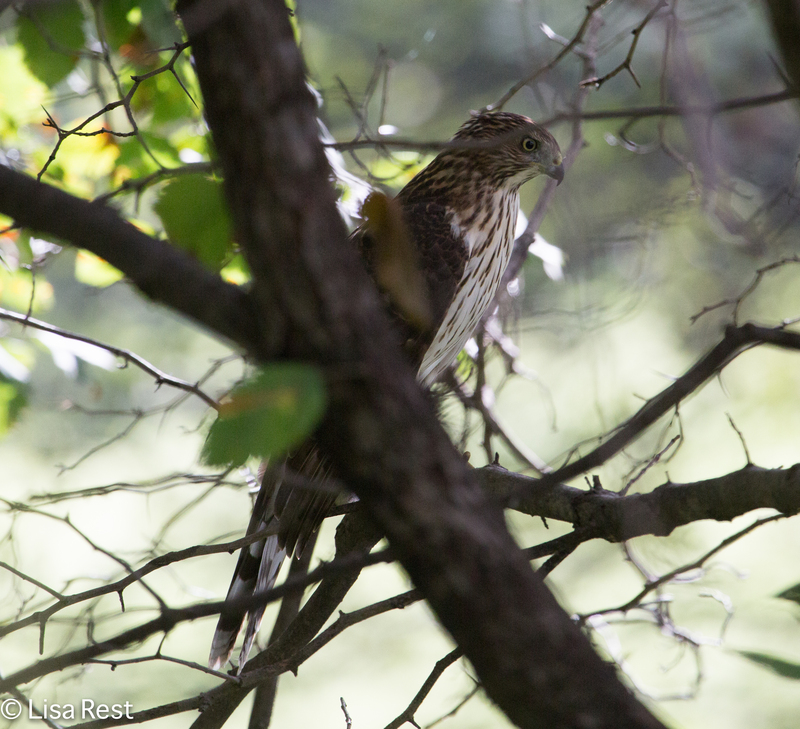 There were two young Cooper’s Hawks present. 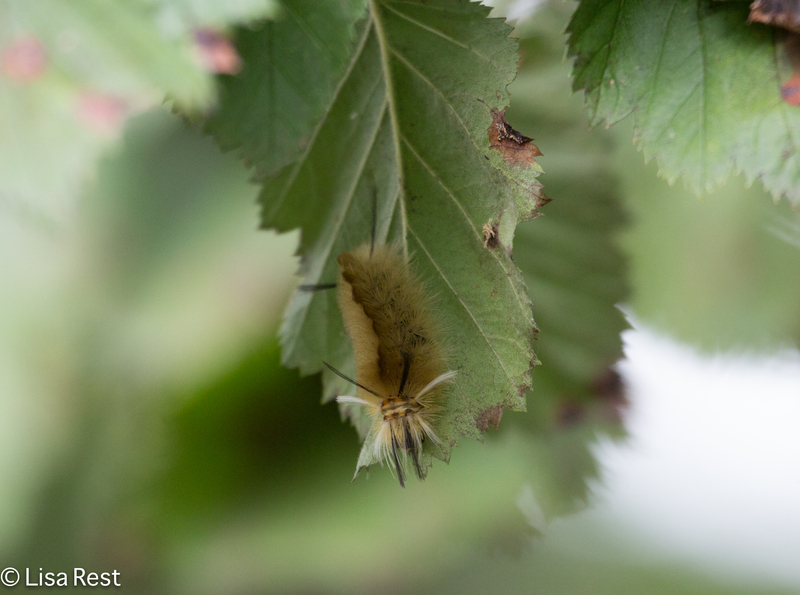 A fellow participant pointed out the caterpillar to me. I did not have my macro lens handy so it’s not a great picture, but I think it looks like a sphinx moth. I confess to being very lazy and I have not tried to look it up. I must leave this page, it’s getting late and I have to get up and go to work. I hope to return in a better mood. Tomorrow night is the first rehearsal for the choir I have signed up for. I have received the first email from Bill Hilton about November’s Costa Rica trip. There’s room for more participants: he didn’t say how many we were but the optimum number is 12. Time for me to start thinking about this trip. I’m looking forward to contributing to Bill’s research for a week.